Needles and Hooks and Books, Oh My! : FO Friday: Slippers, Hats and Flowers! I've had an extremely productive few days. 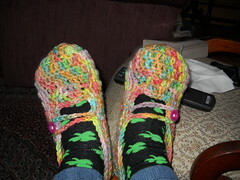 I whipped up these slippers in a few hours, but am still debating their color. I used Paton's Classic wool, dyed with Kool-Aid by a couple of young cousins who thought every color under the rainbow would be cool. Everyone in my house thinks they look like fruit loops. What do you think? I also finally finished the sewing on a pair of baby dino hats. Both of them are going to friends who are having babies in March. 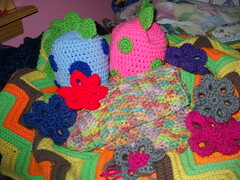 I also have 2 craft shows in March, and I've been working on flower stretchies. My flower headbands went over fairly well in the fall, and someone suggested I put the flowers on a hair elastic. Hopefully both of them will do fairly well this time also. 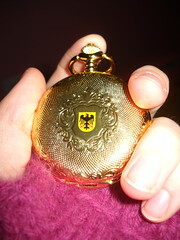 My bf has been home for a few weeks- YAY- and he brought me back a pocket watch! It's from Germany, and it makes me feel really cool, with the chain hanging from my pocket. Isn't it pretty? I'm joining up with Tami's Amis FO Friday-- check out more lovely stuff here! That looks like a nice slipper pattern. It does look very colourful. Yes, fruit loops, absolutely. Very cool watch - how thoughtful! I'd say more like Fruity Pebbles. How fun that you got a chance to dye with your cousins; I've been meaning to do that with my horde of nieces and nephews for a long time. Though I guess it could end up with some crazy colorways! I'm voting Fruit Loops! Very colorful and very cute. The pocketwatch is wonderful. You are lucky in your BF.